The Dell EMC PowerEdge T640 tower server can be used as a tower or 5U rack server with an optional rail-mount kit. It's designed for use in remote or branch offices but can also be used in datacenter environments with an optional rail kit. New features on this system include more NVMe drive support, 10GbE, updated management with iDRAC 9.0, and support for Intel Xeon Scalable processors. The case design, which is very similar to the previous generation T630, features a new honey comb bezel. The bezel comes with a lock to secure the front mounted hard drives and can be ordered with or without an optional LED display panel. This system is ideal for virtualization, database, analytics, finance, education, and science. One or two Intel Xeon Scalable processors can be installed in the Dell T640. Choose from Bronze, Silver, Gold, or Platinum. You can install processors with up to 28 cores each for a maximum core count of 56 cores in a two processor configuration. Start out with just a single processor, and as your business grows add another processor to support more memory, storage, and PCIe channels. With dual processors the Dell EMC T640 server will support a total of 24 memory slots that can be outfitted with DDR4 Registered (RDIMM), Load Reduced (LRDIMM) or Non-Volatile (NVDIMM) memory modules. Depending on your choice of processor, memory modules, and memory configuration memory will operate at speed of up to 2666MHz. One to 12x 16GB NVDIMM modules can be installed in a two processor configuration only, but must be paired with 12 RDIMM memory modules. The system can support a maximum of 3TB of memory using 128GB memory modules. 3.5-inch drive chassis configurations include 8 or 18 SAS, SATA, HDDs or SSDs for a maximum storage capacity of 180TB. Using 2.5-inch drives the system will support up to 16 or 32 drives, again using SAS, SATA HDDs or SSDs. Another configuration combines up to 16 2.5-inch drives with 8x NVMe SSDs for a maximum storage capacity of 112TB. Optionall storage options include an integrated Dual SD Card Module (iDSDCM) for redundant hypervisor support that includes a vFlash module for use with iDRAC 9.0 disk image storage. A few new and updated HD controllers have also been added and include an updated integrated S140, H740P, and an H840P for external drive support. There's also a 12Gb/s SAS HBA. Drive types can be mixed and matched to provide tiered data processing. A single processor activates PCIe slots 1-3, with dual processors all eight PCIe 3.0 expansion slots on the system board are active. There's also an internal PCIe slot dedicated for a PERC HD controller or HBA. GPUs are supported only in the rack mode configuration and can only be installed in systems with 1100W power supplies or higher. 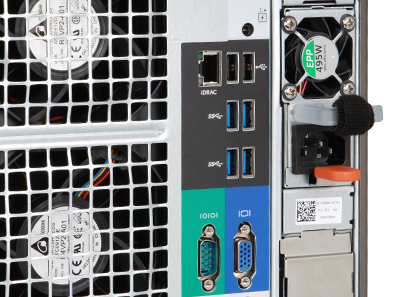 You can install two double-width 300W GPUs on a single processor or up to four 300W double-width cards with two processors but the system will not support any additional add-on cards and may require optional external fans. Management has been upgraded with the new embedded iDRAC 9.0 with Lifecycle Controller. Quick Sync, which works with a smart phone or tablet has also been updated to work with wifi and it can now be used with both Android and iOS devices. Quick Sync 2 is integrated into the chassis so you don't have to purchase a Quick Sync bezel like the Gen 13 systems. OpenManage Essentials is included with the system to provide one-to-many server support. The Dell EMC PowerEdge T640 tower server is a very practical addition to a startup business with the ability to scale as your business grows. This system is also right at home in the data center with the ability to be rack mounted as a 5U server to support VDI applications with the addition of up to four GPU accelerators.